I know this article won’t be of interest to everyone, but, in all fairness, even though I’m sifting and sorting through thoughts concerning the spiritual path I’ve been walking for over 40 years, I think it speaks to something bigger that’s been going on in our world. I hope you will bear with me as I once again begin a journey to the center of my mind. Labels. The nouns and pronouns we use to describe people, places and things in our world to others. Many have decried that they “hate” labels, asking why we even need them. It’s really simple – to communicate to others what we’re talking about. Specificity. A pie describes a particular type of dessert but an apple pie is even more specific. If you take the apples out, you still have a pie, but it’s not an apple pie anymore. No matter how bad you want it to be an apple pie, it just isn’t. To call it so makes as much sense as calling a cucumber a peach. Just because you wish it to be so, doesn’t make it so, no matter how strong your desire. I came to my spiritual path in 1974. Long story short, I had been seeking something that encompassed my philosophies and beliefs concerning Life. After searching the more mainstream paths, I ran across The Complete Art of Witchcraft by Sybil Leek and it was here I found what I was looking for. About 25 or 30 years ago, I began to step back from being public about who I was and what I believed. Why? I didn’t like what I was seeing happen in the Wiccan/Pagan/Magickal community. Everything was becoming so watered down. Even the books that were being written in that time period had so much missing. It was and is troubling. I know the only thing constant is change and that without change comes stagnation. Even though I’m a stubborn Taurus, who doesn’t particularly like change, I know it’s necessary for growth. Still, is it necessary to throw the proverbial baby out with the bath water? Is it necessary to change things so radically that, by its original name, something is no longer recognizable? I would think if you wanted to change something that much, you would have created something new and entirely different that needs a new and entirely different name. This is what has happened to the spiritual path called Wicca. 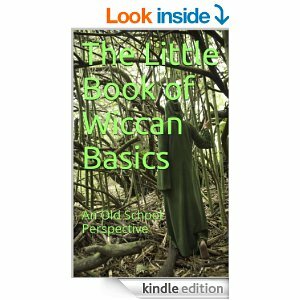 Known today as “traditional” Wicca, it is barely recognizable in the myriad of definitions given by those who call themselves “witches.” I know I’ve written other articles mentioning this and how when I entered the Craft in 1974, Wiccans were Witches and, not until Anton Szandor LaVey decided to call his Satanic followers witches, there were no other explanations for those two terms. A Witch was a Wiccan and a Wiccan was a Witch. This is far from being true now. A student of our Temple gave me a book to read that he thought everyone should read. I have avoided reading current books that professed to be about Wicca and Witchcraft for all of the reasons I stated earlier. I was always disappointed and sometimes even shocked at what I was reading. On his recommendation, I began reading Traditional Wicca: A Seeker’s Guide by Thorn Mooney. Seeing that she is a Gardnerian Priestess gave me hope since Gardnerian is one of the tradition I began in back in the beginning. Although I haven’t finished the book yet, I feel I’ve read enough of it to say, this book at least offers an acceptable explanation of what was and is going on in our community. I can also say I can agree with about 95% of what she says in the book. There is a lot of good information in the book for those who might be thinking this is the spiritual path for them. The 5% I don’t necessarily agree with could just be me being overly specific or being unwilling to give ground to some things in some areas. Or it could just be I refuse to call a cucumber a peach under any circumstance or a pie an apple pie without having apples in it. I’m not in denial of change. I just believe when you change something too much, a new label becomes necessary. Take the outside world. People, especially those in power, are always trying to redefine something in order to gain power or make a profit. It’s become a world where if we don’t like the way something is, and you have the money and power to do it, you just change the definition to your liking so you can ease your conscience or line your pockets. Why wouldn’t some try to redefine what constitutes a spiritual path and, rather than giving it a new name, continue to call it by the original name even though what is being practiced had little, if any resemblance to the original spiritual path? And what would be the reason to retain that same name? In Wicca/Witchcraft, I would be hard pressed to believe it has to do with profit and I would hope it wouldn’t have to do with power, especially over others. Is the term “Witch” such a delicious word that everyone wants to be called that, even though they’re not willing to be part of the discipline and tradition of that path? When the Reformation happened, the division didn’t create two branches of Catholicism, It ultimately created the Catholics and the Protestants. Even among the Jewish faith there are the Orthodox Jews and the Reformed Jews. I’m sure there are other examples that I have no knowledge of. My point is, when you decide to do something very different from where you began, it needs a new name or designation. You’ve become a new tradition, at least, if not a whole new spiritual path. I’m really having a difficult time wrapping my head around this. I guess with the dark of the year approaching and the “Season of the Witch” soon upon us, this has surfaced within me and finally needed to be outwardly expressed. I thank you for time and your patience. Perhaps there will come a time when I can find resolution for all this within me. For now, I appreciate the opportunity to share this with you. This entry was posted in Astrology, Pieces of the Puzzle and tagged Magick, Paganism, Reformation, Samantha Herron, Self-Help, Sybil Leek, The Old Religion, Thorn Mooney, Tradition, Traditional Wicca, Wicca, Witch, Witchcraft. Bookmark the permalink.